Frank Robinson Has Passed Away. This one is personal to us. We remember Robinson (and his brother Brooks) as members of the Baltimore Orioles. 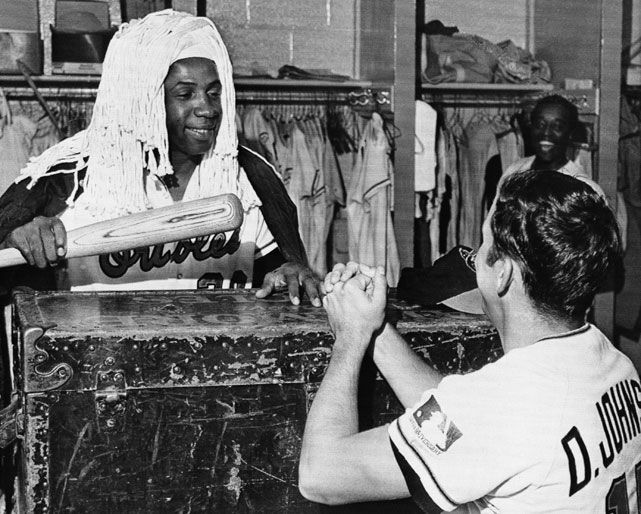 We never saw a more gracious off the field, fierce competitor on the field than Frank Robinson. That 1966 MVP season included a sweep of the powerful Dodgers in four games. That MVP vote meant that at the time, Robinson was the only person to win the MVP in both leagues. After the 1966 season, the O’s put out a book on the season including the above image. During the season the team established a “kangaroo court” where players were fined by “Judge” Robinson for infraction on everything from plays on the field to being late to meetings, to wearing ugly clothes. Lord help a player that dared questioned his rulings. Robinson became the first black manager in MLB history when he was named as a player manager for the Cleveland Indians. After concluding the 1974 season as a member of the Indians, Robinson made history in 1975 as the first African-American to be named manager of a major league club, while he was still playing. It must have been us because we never thought of Robinson being defined by his race. We only saw the player and the leader and thought he would make a great manager. The fact that he broke a color barrier didn’t matter to us as it did to others. He had earned the job, in our opinion. Robinson was elected to the Hall of Fame on the first ballot. Anything else would have been a farce. We feel lucky to have seen Robinson in his prime – to watch him, to learn from him and in a really tiny, minuscule way be a part of those who helped create his legacy by cheering and rooting for a man of his talent and humanity. Heaven just got a really good player for their team. For a few years he made it worth the price of spring training tickets just to go watch him sit on a bucket by the dugout at Space Coast Stadium. Great player that loved and played the game like few ever could, and a better man.